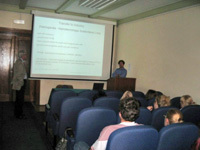 Dr. Bojan Marinković, Research Fellow at the Materials Science Department of the Pontifical Catholic University of Rio de Janeiro (Pontificia Univesidade Catolica do Rio de Janeiro – PUC Rio) visited the Institute of Technical Sciences of the Serbian Academy of Sciences and Arts on June 24, 2009. 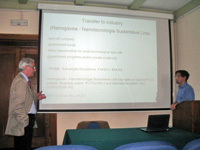 His visit is a result of the cooperation under Cultural, Education and Scientific Agreement signed between the Institute and PUC Rio in June 2008. 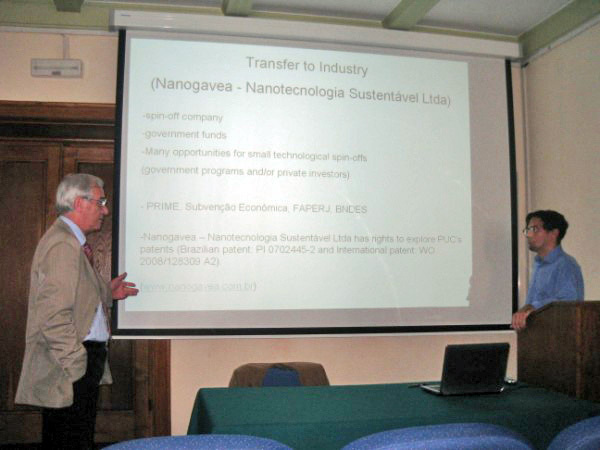 On that occasion, Dr. Marinković gave lecture entitled “Titanate nanotubes and nanowires: technology transfer from University towards industry” at the Serbian Academy of Sciences and Arts in which he presented the latest research into these materials, as well as the opportunities for technology transfer towards industry through spin-off companies. 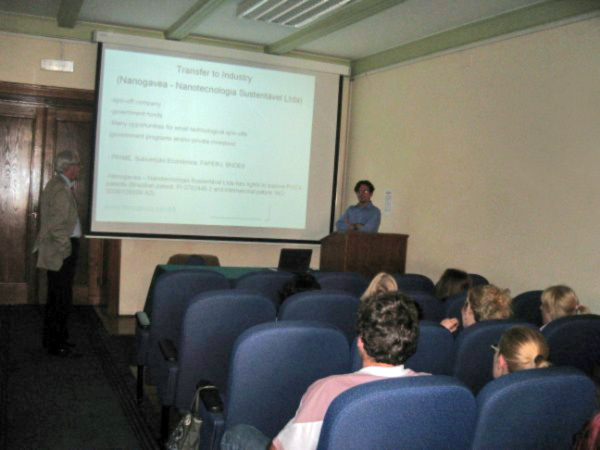 Dr. Marinković’s presentation was based on the results published his recent papers and patents. Mancic, L.T., Marinkovic, B.A., Jardim, P.M., Milosevic, O.B., Rizzo, F. 2009, "Precursor Particle Size as the Key Parameter for Isothermal Tuning of Morphology from Nanofibers to Nanotubes in the Na2-xHxTinO2n+1 System through Hydrothermal Alkali Treatment of Rutile Mineral Sand", Crystal Growth and Design, vol. 9, no. 5. pp. 2152–2158. Morgado Jr., E., Zotin, J.L., De Abreu, M.A.S., De Oliveira Rosas, D., Jardim, P.M., Marinkovic, B.A. 2009, "Characterization and hydrotreating performance of NiMo catalysts supported on nanostructured titanate", Applied Catalysis A: General, vol. 357, no. 2 pp. 142-149. doi:10.1016/j.apcata.2009.01.009. Morgado Jr., E., Marinkovic, B.A., Jardim, P.M., De Abreu, M.A., Rizzo, F.C. 2009, “Characterization and thermal stability of cobalt-modified 1-D nanostructured trititanates”, Journal of Solid State Chemistry, vol. 182, no. 1, pp. 172-181, doi:10.1016/j.jssc.2008.10.008. Marinkovic, B., Jardim, P., Morgado Jr., E., De Abreu, M., Moure, G.T. Rizzo, F. 2008, “Hydrothermal synthesis, crystal structure and thermal stability of Ba-titanate nanotubes with layered crystal structure.” Materials Research Bulletin, vol. 43, no. 6, pp. 1562-1572, doi:10.1016/j.materresbull.2007.06.016. Marinkovic, B.A., Mancic, L., Jardim, P.M., Milosevic O. & Rizzo, F. (2008) Hydrothermal synthesis of NaxFexTi2-xO4 from natural ilmenite sand: A CaFe2O4 structure type compound, Solid State Communications, Vol. 145, No. 7-8, pp. 346-350, doi:10.1016/j.ssc.2007.12.006. Morgado Jr., E., De Abreu, M.A., Moure, G.T., Marinkovic, B.A., Jardim, P.M., Arajuo, A.S. 2007, “Effects of thermal treatment of nanostructured trititanates on their crystallographic and textural properties”, Materials Research Bulletin, vol. 42, no. 9, pp. 1748-1760, doi:10.1016/j.materresbull.2006.11.020. Morgado Jr., E., De Abreu, M.A.S., Moure, G.T., Marinkovic, B.A. Jardim, P.M., Arajuo, A.S. 2007, “Characterization of Nanostructured Titanates Obtained by Alkali Treatment of TiO2-Anatases with Distinct Crystal Sizes”, Chemistry of Materials, vol. 19, no. 4, pp. 665-676. Morgado Jr., E., De Abreu, M.A., Pravia, O.R., Marinkovic, B.A., Jardim, P.M., Rizzo, F.C., Arajuo, A.S. 2006, “A study on the structure and thermal stability of titanate nanotubes as a function of sodium content”, Solid State Sciences, vol. 8, no. 8, pp. 888-900, doi: 10.1016/j.solidstatesciences.2006.02.039.